Born the son of a wealthy merchant, Francis spent his youth in extravagant living and pleasure-seeking. Although he was wont to lavishly spend his money, he was also generous. Francis never refused a beggar who asked for alms for the love of God. When a war broke out between the cities of Assisi and Perugia about the year 1200, Francis was taken prisoner and held for a year. Upon his release, he was stricken by a long and serious illness which he bore with great patience. Francis recovered and for a while returned to his former way of life, but he found that he no longer had the heart for it. At one point, he heard a voice from heaven which told him “to serve the master rather than the man.” While Francis did not immediately recognize what he was being called to, he began to devote himself to a life of poverty and care of the sick and poor. For this he was angrily denounced by his father and disinherited. Francis had a vision of Christ who told him to "build up my house, for it is nearly falling down." Seeing this call first in the physical sense, Francis rebuilt several churches in Assisi which had fallen into disrepair. Eventually Francis saw a deeper meaning to Christ's words. Many people were attracted to the simple way of life espoused by Francis, and he founded the Order of Friars Minor (Franciscans) in 1209. Within a few years, his order had spread over the Alps to France, Spain, Germany, and Hungary. In 1219, he sent missionaries from his order to Tunis and Morocco and he himself went to Egypt to evangelize the Mohammedans. Though he met with the Sultan at Damietta, Egypt, which was then under siege by Crusaders, his mission was a failure. At Christmas, 1223, Francis built a crèche at Grecchia, Italy, and thus popularized a custom observed all over the Christian world to the present day. In September of the following year, Francis received the stigmata, where his feet, hands, and left side were marked as were Jesus’ during his passion and death. 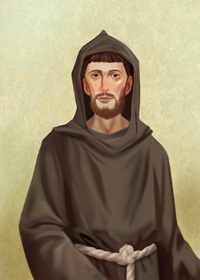 St. Francis of Assisi is the patron of Italy. He is also the advocate for Catholic Action and the protector of merchants. His Memorial is celebrated on October 4. Francis’ message today: This saint discovered the “selfish secret” which is made clear in his prayer, “It is in giving that we receive; in loving that we are loved....” Francis received much and was loved greatly, for he himself gave generously and loved abundantly. Do you recognize that giving of your time reaps tremendous rewards? That loving the unloved will bring love back to you many times over?